We received a number of these products for review purposes. As always all opinions are honest and my own. If you know anything about me it is that I am a Disney fan. Or more accurately we are a Disney loving family. 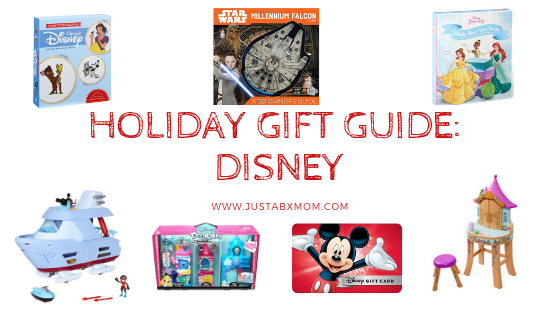 You can’t go wrong by getting me and JustaBXgirl gifts from Disney and chances are other people on your shopping list are just as into the mouse and his world as we are. Here’s a short list of some items you can pick up for the Disney lover in your life today. We added items that make you think outside the box because they show the Disney lover in your life that you put some thought into the gift and didn’t just pick up the first Mickey ears you found! Cross Stitch Creations Classic Disney – I can remember receiving cross stitch sets as a child and loving doing them with my mom. I can’t wait to share something so simple with JustaBXgirl especially since these are Disney themed. Now, personally, I think she’s still too young to do this so this year I will be gifting this to my niece and hoping she will do them with me! Disney Doorables -Now these have been on my list since I first saw them at the beginning of the year. I was so excited that Moose Toys was partnering up with Disney. Two of my favorite brands. Take all of my money!!! Can I admit that I really don’t want to share these with my child? I want to collect them all and showcase them. Incredibles Hydroliner Playset -This was on JustaBXgirl’s Christmas list as soon as we left TTPM’s Holiday Showcase. She was a fan of the Incredibles 2 even though she hadn’t seen the first movie and said she could have all types of Incredible adventures if she got her hands on this! Disney Princess Rapunzel Tower Vanity – Every year JustaBXgirl gets a big ticket item for Christmas. This year it will be this vanity. My Disney Princess is quite the girly girl. She spends time every morning primping for school and I can already see her sitting at her vanity styling and profiling. Star Wars Millenium Falcon A 3D Owner’s Guide – Now you might not be able to get your Star Wars lover their own Millenium Falcon but that doesn’t mean that you can’t get them an owner’s guide that breaks down the entire thing layer by layer and detail by detail. Disney Princess Make Your Own Soap – This is great for your little science loving Disney fans. Your creative littles will enjoy mixing and pouring to create their very own useable Disney Princess soaps. They can make twelve projects with this kit. Disney Gift Cards – If you know your Disney lover is heading to Disney soon this is an amazingly thoughtful gift. They can use this to pay towards their trip, buy souvenirs, get some snacks at the park and so much more. And if they aren’t planning a trip this might help them decide to get to planning or just give them the opportunity to visit a Disney store and feel closer to the Pixie Dust.